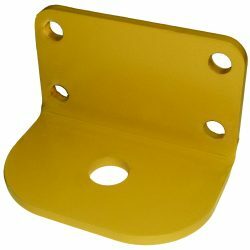 The BHS Cable Retractor Mounting Bracket is an essential piece of cable management equipment for forklift battery chargers. The bracket mounts a Cable Retractor onto a Charger Wall Bracket to keep your battery room hazard-free and well-organized. Warehouse managers sometimes overlook the importance of good cable management when there are seemingly larger problems that need attention. However, poor cable management is extremely costly in the long run. Cables on the floor create tripping and snagging hazards, absorb much more wear and tear, and slow down the battery charging process. In addition to these issues, damaged cables can become an electric shock hazard. Luckily, BHS provides comprehensive Cable Management solutions especially for battery rooms. We offer simple solutions to keep your battery room safe, organized, and efficient. Contact our sales team at +1 314 423 2075 to discuss potential solutions for your cable management needs.